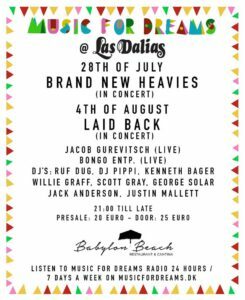 Music For Dreams has announced a series of parties at Las Dalias hippy market in Ibiza this summer. The first event, on Thursday 28th July, features a live concert by The Brand New Heavies, pioneers of the acid jazz scene in London in the eighties and nineties. The Brand New Heavies translated their love for 70s funk into a sophisticated sound and became the global torchbearers of classic soul in an era dominated by hip-hop and house. They will be performing a full live set including their hits, ‘Dream On Dreamer’, ‘Never Stop’, ‘Stay This Way’ and ‘Midnight At The Oasis’, all of which were hugely popular in Ibiza at the time. 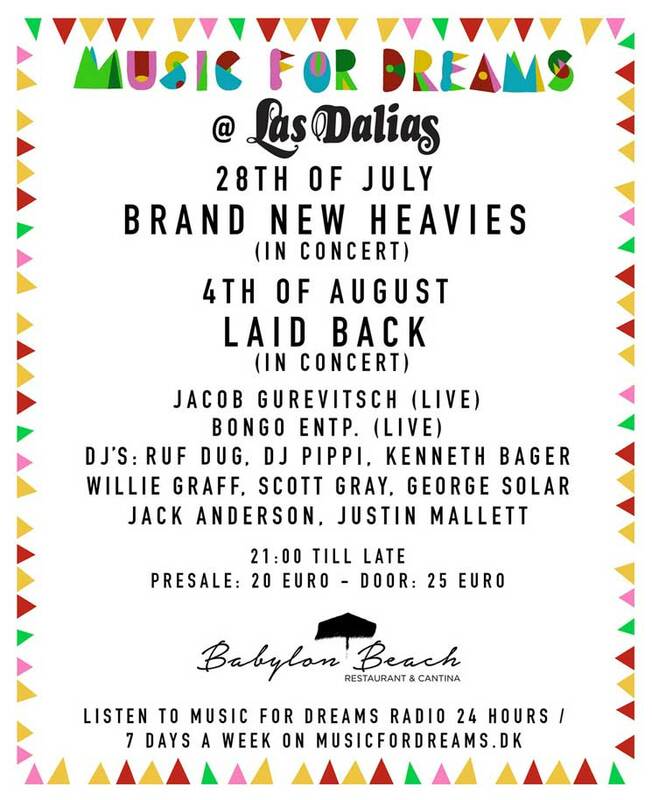 Music for Dreams, the Balearic music label based in Copenhagen has joined forces with Vaughan from Pacha’s Funky Room and Babylon Beach to create a trio of parties where the original Balearic spirit of Ibiza returns to the island with a club event and a musical policy where anything goes as long as it’s quality, funky and hips move. Providing the Balearic beats will be original Ibiza DJ, Pippi, Music For Dream’s head honcho Kenneth Bager, and many other familiar names. Home of Ibiza’s legendary hippy market, Las Dalias has been on the scene since 1954. The iconic venue is located on the main road between Santa Eulalia and San Carlos and is one of the main congregating points for Bohemian Ibiza. We talked to the two bang up to date old timers who share a love of the past with all things contemporary. Kenneth Bager is the well-known and much loved man behind the Music For Dreams label. Vaughan is the man of many hats everybody knows from either or both Pacha’s Funky Room and more latterly as one third of the partners at uber-cool Babylon Beach. Though they are both involved in the Ibiza of today, their legacy goes a long way back. It was his Danish dance music that opened the door first to playing Ibiza’s clubs in the late 80s and early 90s. Ken “I remember Vaughan from my earliest days in Ibiza, he is part of the original Ibiza dance music scene and our paths have crossed many times. It feels like a natural partnership to be working with him”. Vaughan’s arrival in ‘82 sparked the start of 14 years on the dancefloor of Pacha as his perhaps spiritual home, but also taking his brand of Balearic moves around the world during the winter months. Vaughan “After all that time dancing the next step was to open Pacha’s funky room with DJ Pippi and it has been running continually ever since; now on Friday nights. We still love what we do there but at the same time I am always looking for new ideas. I have always been a huge fan of Las Dalias as a venue and it is great that it is now being used to much more of its potential. Vaughan and Ken do seem to have a lot in common but also strike you as quite different people. One of their definite similarities is that they are both ideas men and I felt certain that in working together an event would not be as simple as ‘performer comes on stage, plays set, receives applause, plays encore, show over’. Knowing Vaughan and Ken, there would be much more to it than that. Ken: “After the live music stops outside, we will continue with performers to keep the festival feel and we are also looking to use the basement which not so many people will know. We are prepared to put in all of the effort to see the project grow. We have quite modest expectations for these first few gigs but a real confident feeling that it will be popular and successful in the long term”. With talk of a return to dance and away from the dreaded phone obsession, I had to ask whether they were looking to recapture a past time, an Ibiza that is no more and perhaps could never be again. Ken “for sure we are drawing upon the feeling from the early days of the Balearic beat. 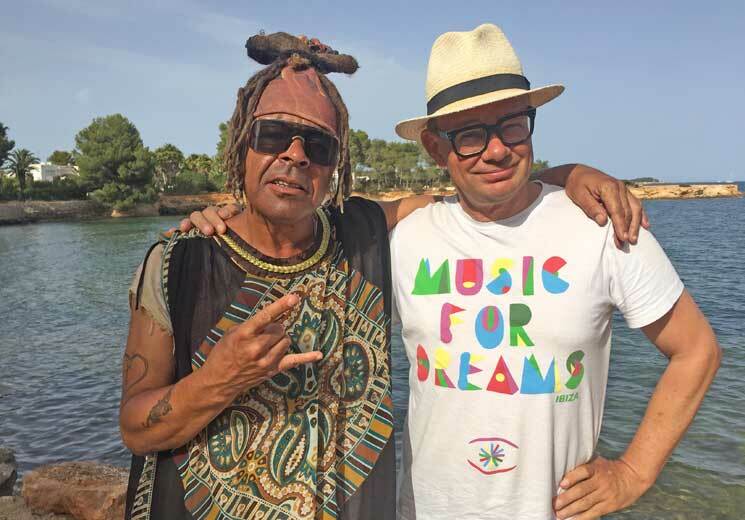 The thing that made the whole musical culture of Ibiza were the days of Alfredo and the anything goes philosophy. If it sounds good and creates a good groove, it is ok to play”. Vaughan: “but this is not a retro event. We are not looking to emulate the parties we remember. It is about drawing on that experience but applying it in a contemporary way. We are all for progress and music moving forward, but we want to hold onto the central vision that music is about enjoying yourself and about dance”. Most people who know Vaughan will be familiar with his dance heritage – he always says that his love of dance came about through wanting to catch the girl and the best way to do that was on the dancefloor. It wasn’t long before that bad seed; the telephone reared its head again. I asked if they were going to take any steps to enforce a no phones policy, something that has been tried by 1 or 2 promoters, though in my experience with very limited effect. Ken “we want to make our parties nights people will remember. We will have some talking points for sure, which has always been one of the ingredients of the best club nights – where it steps up to being a show, engaging all the senses, sight as well sound. I am not saying we are going to be making love on stage”. I sat up to attention at this point as it seemed quite a leap from performance to the prospect of Vaughan and Ken getting jiggy manumission style, but it would be hard to argue, that certainly would be a talking point. In an effort to clear some pretty strange mental imagery, I changed tack to ask of the reasons behind their choosing Brand New Heavies for the opening show and LaidBack on the 4th August. It is true, the Brand New Heavies do seem to have a universal appeal, everybody likes their music and whereas some dance genres seem to have a love or hate reaction, the Heavies seem to fill a centre ground where everybody feels at home. When they played at Ibiza Rocks two years ago, we discovered that in the office everybody knew of them, but nobody could really name any tracks; then once you have heard those tracks, you knew they were familiar tunes that you had grown up with. With this in mind I asked Vaughan to describe the Brand New Heavies for anybody reading that could not bring any of their songs to mind. NG: And how about LaidBack? Ken “Laid back are a Danish group. They might not be a household name, but to the end of 2015 they had sold 35million records, which is not bad going. They have had 3 number ones in Denmark and you will know some of their biggest tunes when you hear them. We have supporting them on the 4th Jacob Gurevitsch and also Bongo Enterprise who have a Brazilian feel”. Knowing Ibiza as we all know Ibiza, a project such as this takes a lot of effort and needs a lot of support. I asked Vaughan and Ken who they would like to give a mention in dispatches, by way of thanks. Vaughan “Las Dalias for sure, we are doing it there because we love las Dalias, they have been a great help. Chema and Senna, and a big thanks to Juanito, the owner. Also of course, we both have to thank the people in our own businesses; for Ken Music For Dreams and for me Babylon Beach for their support in enabling us to push this forward. Next articleDreams Can Come True; Carl Cox and Sonica give Gerald the ultimate VIP.